UFO SIGHTINGS DAILY: Morse Code Message On The Surface Of Mars Has Found, Message From Aliens, UFO Sighting News. 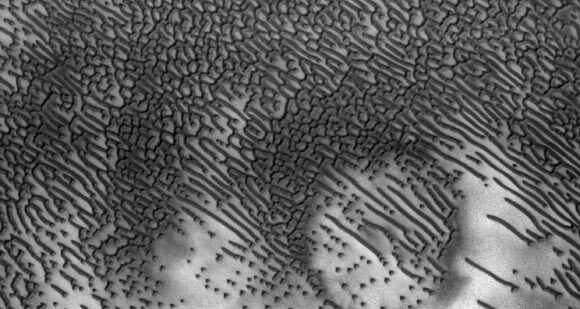 Morse Code Message On The Surface Of Mars Has Found, Message From Aliens, UFO Sighting News. I have noticed this a lot about things on Mars. There is an evenly spaced about of distance that make many things appear to be created by an intelligent hand. Just yesterday I found a closeup of rocks near the rover with just such an occurrence. Its unbelievable, and should be impossible, and yet, here it is, evidence of an alien culture in front of us. NASA Has Found A "Morse Code Message" On The Surface Of Mars NASA’s eyes in the Martian sky came across some odd-looking dashes and dots on the surface of the Red Planet recently, which they pointed out has an eerie similarity to Morse code. The image was taken on February 6, 2016, by the High Resolution Imaging Science Experiment (HiRISE) onboard the Mars Reconnaissance Orbiter (MRO), which has been exploring Mars since 2005.